We passed OROTHO and Joe on the way out of the tunnel; they were laying out mass amounts of wiring for some reason, and to distract them felt like a bad idea. We continued past them, and out of the tunnel entrance into the lab. COLUS was sitting there with AMPHIS, doing a good job of distracting him with a few reports. Approaching the desk, COLUS and AMPHIS looked up. "COLUS, can we talk to you? Syeonyx has a theory on what AMPHIS may have seen." "Very well. What does this concern?" "Syeonyx has deduced a possible supportive theory on AMPHIS actually seeing SERVERE." COLUS looked at AMPHIS, who was looking at him in return, and nodded. "Okay then, come to the discussion room. AMPHIS, you come with us. This concerns you as well." "Right, now what's this about Syeonyx's theory?" "He has determined a further plausible explanation to what AMPHIS saw down in the chamber, which supports what he says. He believes that SERVERE may have been down there in reality, and not in AMPHIS's head. Syeonyx?" I outlined my line of thinking; the whole series of connections that made more sense together than individually. The Lone 7 had been attempting to topple HoN Co. for quite some time now, no doubt drawing attention to themselves. With the finding of the Solus stone, and eventually discovering the true purpose of the stone itself, HoN Co. would truly recognise the Lone 7 as a definite threat. Instead of keeping it in one place, the stone was moved between the base and where SERVERE was stationed, depending on which group had found a portal that needed destroying. It was possible that with SERVERE being alone, he may have drew attention to himself and his whereabouts, which eventually caused HoN Co. to confront him. SERVERE felt the need to hide the stone in the hidden library beneath his house, and protect it with all of his might. They infiltrated his house, and found their way down to the library where he was hiding. It's possible that he fought off a large portion of whatever HoN Co. threw at him, and went back to his house when he thought it was safe. HoN Co. may have just been waiting for him to lower his guard, where they then set upon in and put him in a position which forced him to join them... Or face death. With those types of choices, SERVERE would either have attempted to fight them off or join them. And depending on his alliance with the Lone 7, his actions would reflect that. "So what are you saying? That SERVERE betrayed us and joined HoN Co....?" Yes and no. I know from talking with the others that SERVERE was clever. Maybe he decided to join HoN Co. and appear defeated, but actually maintain and in fact strengthen his alliance with the Lone 7. With HoN Co. feeling as though they had won, they would no doubt use him to point in our direction so they can put a stop to all of our actions, but instead, SERVERE pointed HoN Co. in random directions, making pointless connections and overall distracting HoN Co. from our true hiding place. It's possible that SERVERE was protecting the members of the Lone 7 from HoN Co. from the inside... There was silence for some time, with AMPHIS and COLUS thinking it over. "So what you're saying is that AMPHIS did indeed see SERVERE down in the chamber, but without wanting to put us in further danger, he fled...?" It was definitely possible. HoN Co. would likely have allowed SERVERE to scout out areas alone, and it wouldn't be at all impossible to assume that SERVERE had a place nearby to watch over us, to ensure our safety. It all depending on SERVERE's allegiance with the Lone 7 at the time. "Well when we found SERVERE, he was in the same position as the rest of us. HoN Co. had more or less destroyed everything he had worked hard for, and he had taken it pretty badly. He had only just managed to escape before we found him and took him under our wing. I would say he was the most grateful for that. His allegiance to us was massive! I don't think there was anything he wouldn't do for the benefit of us all. He had this thing where he felt like he needed to prove to us that he was glad of our decision, and constantly tried to prove himself. Maybe... If what you're saying is right, he's been protecting us all of this time..."
"I hope this is the case. It proves that I'm not going insane, and it shows that we have someone on the inside that is watching over us." "What did he do when you saw him?" "He didn't really do anything. He just stood there looking straight at me. He flicked something on the side of his helmet, and revealed his face. I'll never forget it. I could make out that he was smiling... Not an evil smile... Not a cold smile... Just... A smile. Then he closed his helmet and ran off..."
"Why did he run off then if he knew that you recognised him...?" "It's possible that HoN Co. don't entirely trust him, and they might have someone watching him... I wouldn't put it past them. It's what I would do in that situation." "So SERVERE couldn't make any attempt to contact us in case it was viewed by whoever was watching him...?" The room fell silent for some time, as though we had all accepted AMPHIS's sighting as truth. It was still unfounded, but it made everyone feel a little better about the recent events. We continued talking for some time, mainly outlining what the impacts to us as a of group were about accepting this idea. But logic burst through once more, and COLUS finished with the fact that we couldn't prove who AMPHIS had really seen. But from the looks on everyone's faces, they were all consoled to the idea that AMPHIS had seen SERVERE, in the hopes that we each see him return to us. 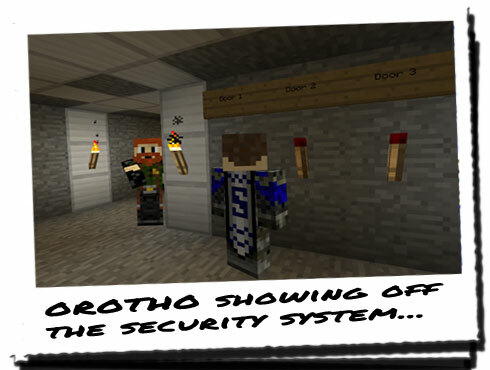 We've gone back to the tunnel, via OROTHO's boasting about the new system he and Joe have implemented. As we passed the entrance, he stopped us and took us back to where there were a series of bulbs on the wall with signs above them. "This is the security system that informs us of the current state of the doors. If the bulb is lit, it means that corresponding door is open. If it is not, the door is closed. Every time we leave this tunnel from now on, all of these bulbs must be out. Remember that!" We waited as OROTHO sent Joe to open one of the doors, watching the bulb remain off for some time. Eventually there was a distance clunk noise, and the bulb on the far left turned on! OROTHO seemed incredibly pleased with his work, and Joe can running back to check on it. Seeing it lit, he smiled to OROTHO and went back to close it, whereupon the light then went off. "Remember: off is closed, on is open. They all have to be off before you leave for the lab, even in the middle of tunnelling. It wouldn't take much for someone or something to find that surface hole and attempt to gain entry."